Major faults occuring in the distribution system such as arc flash, incipient cable splice fault, high impedance fault, etc. must be sensed quickly and islotated immediately to prevent hazards to the general public and personnel. Electrical technicians are exposed to various hazardous conditions when they work live on a power system. Arc flash is the most devastating of these hazards as it can cause catastrophic damage, fire or injury. 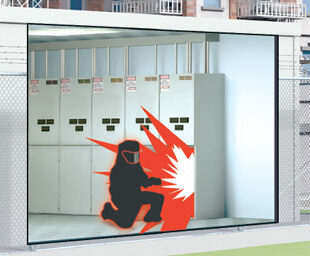 An arc flash is a voltage breakdown of air resistance, resulting in a flash over from one exposed live conductor to another conductor or to ground. The massive energy released during an arc flash fault sends concentrated radiant energy, hot gases and melting metal outward at 35,000 degrees Fahrenheit (F) or four times the temperature of the sun’s surface. In addition to the explosive blast, electrical workers caught in such a condition may suffer severe radiation burns, damaged eyesight from high-intensity flash, and hearing loss and brain damage from accompanying pressure waves. Three factors determine the arc flash intensity on line personnel- the available system fault current, the time for the arc flash to clear, and the individual’s distance from the arc. 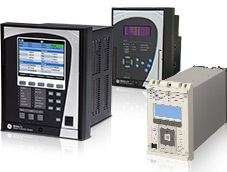 Various configuration choices can be made with leading edge protection and control products such as the Multilin 850, 350, 750, F60, F35, F650 and P14N protective relays to affect these factors and in turn reduce the arc flash hazard. 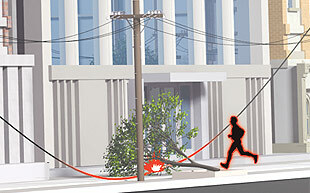 Arcing and downed distribution conductors pose personnel and property safety threats such as fires, injuries, and even fatalities. Since high impedance (Hi-Z) faults do not produce enough fault current to be detectable by conventional over-current relays, they are not detected by traditional protection devices. Hi-Z protection in GE’s Multilin F60 is a unique, field proven algorithm incorporating a signature-based expert pattern recognition system. Harmonic energy levels in the arcing current and a sophisticated expert system assures security and dependability for detection of Hi-Z faults. This algorithm has shown a 90% success rate in detecting downed conductors based on actual in-service utility data. 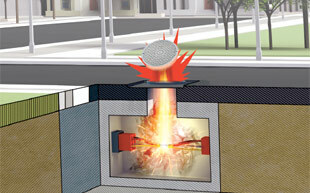 While traditional protection is designed to protect the power system, Hi-Z protection focuses on people and property. Moisture ingress due to defective terminations is one of the major cause of underground cable failures. When water gathers in a subversive cable splice, a momentary line-to-ground fault occurs. Although the fault is self-clearing, the repetitive cycle of water ingress causes the splice insulation to deteriorate and in due course fail. These underground cable faults last a very short duration, which makes the design of an incipient fault protection function quite challenging The basic Multilin incipient cable splice protection algorithm detects a single incipient fault pattern. GE’s Multilin F60 uniquely recognizes the criteria that could lead to these faults, providing sufficient notification ensuring system dependability and safety. Incipient fault detection can be used either to alarm or trip. Either option is reasonable, however the occurrence of a half-cycle event indicates the cable is failing, and a full fault is about to occur in the circuit.